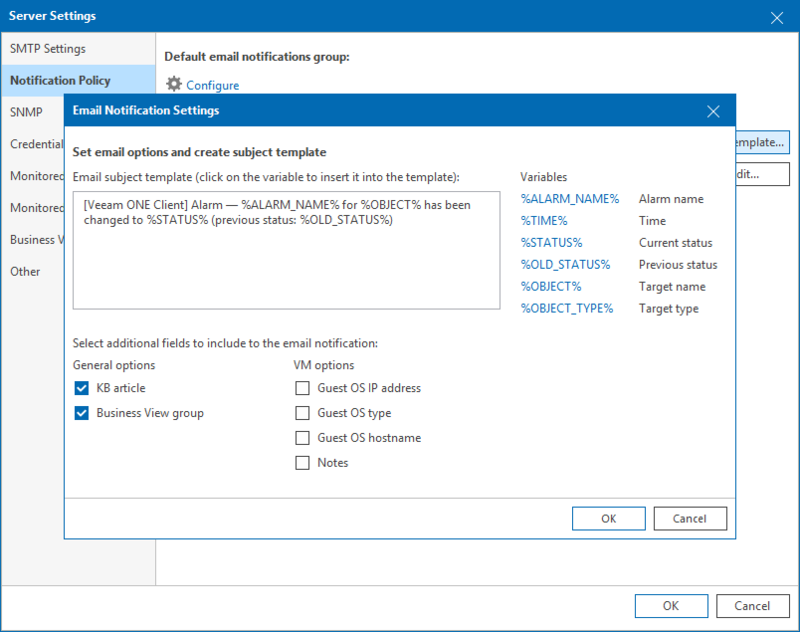 You can customize the email template for Mission Critical notifications only. You cannot modify the template for alarm summary notifications sent in accordance with the Other notification policy. For more information on notification policies, see Step 2. Configure Notification Frequency. In the Email notification policies section, select Mission Critical and click Edit template. In the Email subject template field, specify the subject of the notification. In the Select additional fields to include to the email notifications section, select check boxes next to options you want to include in the body of the email message. General options apply to email notification for all types of alarms. KB article — select this check box if an email notification must include a knowledge base article. Business View group — select this check box if an email notification must include a category assigned to the object in Veeam ONE Business View. VM options apply to email notifications for VM alarms. Guest OS IP address — select this check box if an email notification must include IP and MAC addresses of the affected VM. Guest OS type — select this check box if an email notification must include information about the guest OS of the affected VM. Guest OS hostname — select this check box if an email notification must include a DNS name of the affected VM. Notes — select this check box if an email notification must include custom notes that can be specified in alarm details. By default, Veeam ONE sends email notifications in the HTML format. You can change notification format to plain text. Note that plain text notifications do not support HTML elements, formatted text, colors or graphics. Plain text notifications also do not include knowledge base articles. 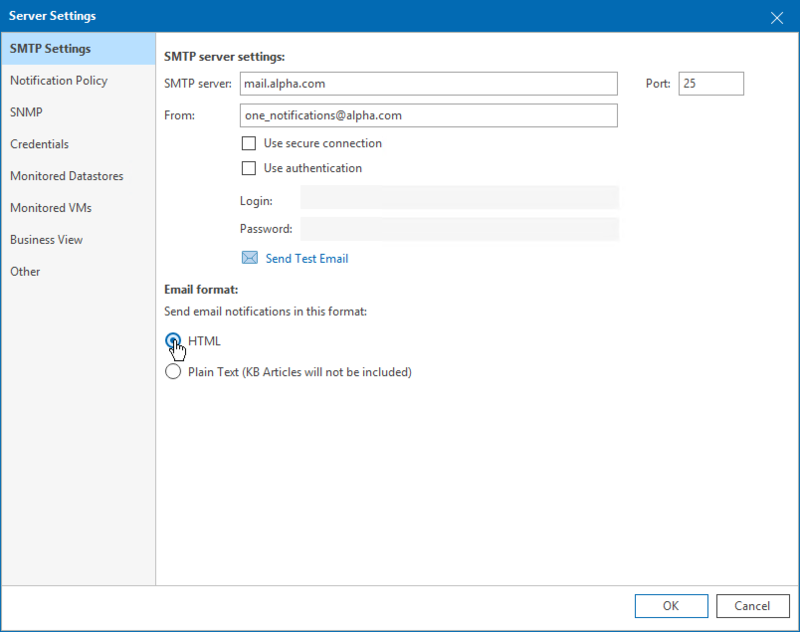 On the SMTP Settings tab, in the Email format section, choose a format: HTML or Plain Text.